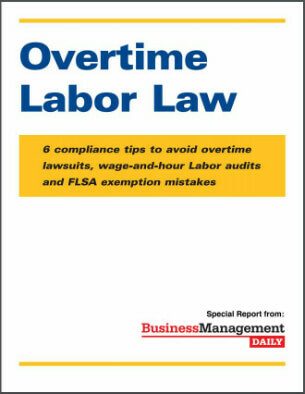 Claim your FREE copy of Overtime Labor Law: 6 compliance tips to avoid overtime lawsuits, wage-and-hour Labor audits and FLSA exemption mistakes! This special report by Business Management Daily, publisher of The HR Specialist and HR Specialist: Employment Law, will help you review your overtime pay policy and double-check your FLSA exempt employees’ status. For years, the DOL has continued to issue a somber report card on employers for violating the FLSA’s wage-and-hour rules. The top mistake for employers—and the most costly one—is wrongly labeling employees as exempt from overtime pay, according to the DOL. For employers, the stakes are high. Employees misclassified as exempt can be eligible for two years’ worth of back wages (three if the violation was “willful”) at 1.5 times the hourly rate, plus liquidated damages equal to the unpaid wages. That means employees can collect up to three times their regular rate of pay. How can you avoid becoming another target of an employee lawsuit or a DOL audit? The key is to regularly audit your workforce classifications and job descriptions to ensure you’re correctly classifying employees as exempt under the current overtime rules. Use this special report, Overtime Labor Law, as your blueprint to do just that. Editor's Note: For more essential information to help your organization properly classify employees, visit Exempt vs. non-exempt: FAQs. When a new hire comes on board, you must determine whether to classify him or her as exempt or nonexempt under the FLSA. You pay the worker on a salary basis. The worker holds a position with certain duties designated by the DOL as appropriate for exempt status. These positions include executive, administrative, professional, computer and outside sales as well as some highly compensated workers. Learn more about overtime regulations, including the “highly compensated” employee exemption, in Overtime Labor Law. Workers who earn at least $455 a week currently may be exempt from overtime pay if they meet the appropriate tests for their classification: executive, administrative or professional. The last category is subdivided into learned professional and creative professional. In addition, special tests control the classification of certain computer employees and outside sales employees. The DOL rules also feature an exemption category for “highly compensated employees.” Essentially, any employee earning more than $100,000 per year and who regularly performs even one of the exempt duties of an executive, administrative or professional employee is precluded from earning overtime. To be considered exempt from overtime, an employee must generally be paid on a salary basis and his or her job duties must meet the DOL’s standards for one of the six exemption categories discussed below. In general, if you answered “No” to any of these questions, you may have misclassified a worker as an exempt employee. Is the employee’s primary duty managing the enterprise or a department or subdivision of the enterprise? Does the employee customarily direct the work of two or more other employees or their equivalent? Does the employee have the authority to hire or fire, and do her recommendations carry significant weight if unauthorized to make the final decision? Is the employee paid the equivalent of at least $455 per week on a salary basis? Is the employee’s primary duty performing office or non-manual work directly related to the management or general business operations of the employer or the employer’s customers? Does the employee exercise discretion and independent judgment with respect to matters of significance? That is, does he or she evaluate and compare possible courses of action and then make a decision or recommendation after considering the various possibilities? Is the employee’s primary duty to perform work requiring knowledge of an advanced type in a field of science or learning customarily acquired by a prolonged course of specialized intellectual instruction? Is the advanced knowledge obtained by completing an academic course of study resulting in a four-year college degree or leading to certification? Is the employee’s primary duty to perform work requiring invention, originality or talent in a recognized field of artistic endeavor such as music, writing, acting and the graphic arts? Does the work require more than intelligence, diligence and accuracy (i.e., does it require “talent”)? Is the employee paid at least $455 per week on a salary or fee basis? A combination of the aforementioned duties requiring the same level of skills? Is the worker’s primary duty making outside sales? Does he or she regularly work away from the company’s place of business? Does the worker sell tangible or intangible items, such as goods, insurance, stocks, bonds or real estate, or obtain orders or contracts for services or the use of facilities? You must pay overtime to every nonexempt employee who works more than 40 hours in a single workweek. The overtime rate is one and a half times an employee’s hourly rate. If an employee earns a fixed hourly rate with no other compensation, computing her base rate is easy. But in many cases, it’s not so simple. Get the full rundown on how to compute overtime in Overtime Labor Law. Online Resources for FLSA Exemptions: The DOL offers two interactive e-tools, FLSA Coverage and Employment Status Advisor and FLSA Overtime Security Advisor, to help you determine the status of a particular position. Safeguard your organization by using them to classify new positions and audit your existing worker classifications. • Travel between home and work. Regular commuting back and forth to work doesn’t count as paid time unless the employee performs work en route. Travel time does count, though, when an employee must travel a substantial distance for an emergency job at a customer’s premises. • Travel as a regular part of the job. When an employee’s duties regularly involve travel, you must count that as paid time. • One-day travel assignments. You must count all such time as work, except meal periods and the ordinary commute. • Extended trips. Travel during normal working hours, no matter the day of week, counts as work time. In certain circumstances, you must pay for the time an employee working an extended shift spends sleeping. • Attendance is outside regular working hours. • Employees don’t perform any productive work during the sessions. • The program doesn’t directly relate to their jobs. The DOL regulation defines civic and charitable work as “hours of service for a public agency for civic, charitable or humanitarian reasons.” Examples include volunteering for nonprofit organizations such as food banks, churches and religious organizations, and fund-raising events designed to raise money for disease research and the like. You also may want to track the number of hours exempt employees work just in case you didn’t correctly classify someone. Why? Because if the employee is reclassified as hourly, you must be able to show how many hours he worked. If you can’t, a court may force you to accept the employee’s inflated estimates. Nothing in the law prevents you from requiring all employees (exempt and nonexempt) to record their hours by punching a time clock or filling out a time sheet. That way, you’ll have the records in case you need them. Just make sure you don’t base exempt employees’ compensation on those hours, or you will jeopardize their exempt status. Protect your organization from costly lawsuits. Download the guide today. Suppose an employee has complained to the DOL about possible wage-and-hour or overtime violations in your workplace. Once you’ve been notified that an auditor is coming, get prepared by conducting your own audit. • Review the differences between federal and state overtime labor laws to ensure you’re complying with the stricter of the two. • Reread the job descriptions of any positions that might be in question. Interview people in those jobs and their supervisors to ensure their job descriptions are accurate. Find out what the workers actually do, and check timekeeping records. • Interview exempt employees to find out how much time they spend on duties typically done by hourly employees. If it’s more than 20% (or in retail, 40%), consider reclassifying the employee as nonexempt. • Check to see that employees are performing their jobs as assigned and working the hours designated by management. If they’re not, insist they start doing so. • Train supervisors and managers on how to determine who’s an exempt employee and who’s not. • Check your overtime records. If you discover unpaid overtime, pay it immediately—even if the overtime wasn’t approved. • Review your policy manual with an experienced employment attorney to make sure it’s complete and in line with the law. • Enlist help with all of this from a consultant or attorney. Many of the regulations are difficult to interpret, and the wrong call could cost you plenty.